Take your monthly conversion amount and divide it by your monthly page views. 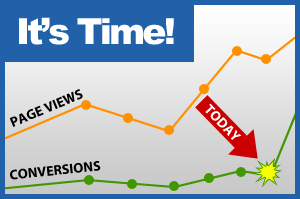 This will give you your blog conversion rate. You will probably be pretty upset by this number because your page views are lying to you. They make you feel like the blog is doing really good, when in fact the numbers that matter are pretty sad. Having lots of page views is a really good thing but without converting those visitors, it is just a wasted resources on your server. This is why you need to do all you can to get that conversion rate up. I propose a three-step plan that will help you. The first thing you need to look at is make sure that you offer them a quality product that is priced right and is relevant to what your readers are expecting to see on your blog. But I know you already have this item taken care of so let’s take a look at the next thing you can do to increase that conversion rate. Increase the eyeball time and make the readers stay longer so you can communicate to them your offer. The longer they hang out on your page, the more time you have to convince them. Like a basketball, lots of visitors will enter your site and bounce right out, those are not the ones I want you to focus on today. You need to focus on the ones that are already reading your stuff. They are already interested in what you have to say. You need to maximize the potential for this type of visitor to convert them into a customer. You need to hook them into staying as long as possible. One of the best ways to do this is to serve them more of your content related to what they already found useful. Most related-posts plugins work ok for this but as I said before, you want to maximize the chances that they will stay longer. I started building a plugin that will do that for my blog. I wanted it to entice the reader to read the next post, getting them to commit to reading the next post before they even get to that page. Fly Related Posts plugin was born, use it! Find out more about it at http://RelatedPostsPlugin.com. As they get done reading your post, they’ll see a list of related posts which will lead them into the next post and then next. As they keep going through your posts they will start getting an idea of who you are and what else is on the blog, header, ads in the sidebar, footer and etc. Your content will be maximized, the more they stay, the more they see. Your offer will continue to ring through to them with every extra second they spend on your blog. The key is to serve them the best content you can create. The second they hit a low quality post or something that is not relevant to them, they are gone. Remember that every time you write a new post, every post counts, every post is an integral part of a bigger picture. compose something amazing. Do it once a month if you have to but make every post count. Once you have some excellent posts in the system, they will continue to do the work and convert more tire-kickers into valuable customers. Quality, relevant product that is priced right. Related posts plugin that captures those eyeballs. Download the plugin and start writing your awesome posts to make your readers stay and read.